An explosively imaginative and artistically crafted tale that deals in magic, wish mongers and an otherworld simply known as Elsewhere. 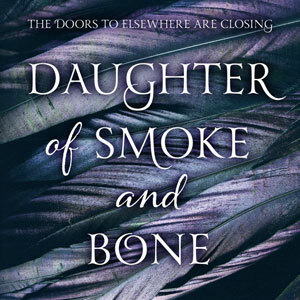 Daughter of Smoke and Bone is one of the most beautifully written paranormal fantasy novels I've read in a long time. Everything about this book draws you in. The concept, the settings (oh, the settings are beyond magnificent), the characters and the romance. It's entirely in a league of its own and will have you gushing in wonder at the fantasticalness of it all. Wait, let me try to explain. Think in terms of dealing in wishes and of leaping through doors that take you anywhere you want to go, but always lead back to one place. Envision beautiful angels and gothic restaurants, while simultaneously trawling through the blanketed-with-snow streets of Prague. Read all about art, grave robbers, and the colourful streets of Morocco (amongst other fantastical descriptions of other countries). But mostly, think about the girl with bright blue hair and the boy with amber eyes; both who come from two opposing worlds, forbidden, but destined to love each other. The first book in a trilogy, Daughter of Smoke and Bone tells the story of 17-year old Karou, an art student who lives in Prague. Seemingly normal (apart from her bright blue hair, which grows from the root), most people don't realise that she lives her life with one foot in the human world, and another foot in a realm where monsters and mythical creatures (known as chimaera) reside. It's in this world where she spends most of her time running errands for a mysterious creature, simply known as Brimstone. Between buying and collecting teeth from grave robbers and murderers to hunters and other unsavoury characters, Karou can't help but wonder just how she ended up in the Elsewhere world that she lives in. Tormented by the knowledge that she has no real identity or past to speak of, Karou's search for answers lead her to a world where the seraph (the angels) and other chimaera-like creatures have been engaged in a bloody war for eons. Along the way, she'll discover that love can develop across enemy lines, uncover the secret behind the wishbone that Brimstone refuses to allow her to touch, and learn that she may be more than just human. If you are only going to read one book this year, make sure that it's Daughter of Smoke and Bone. I can't even begin stress how unbelievable this book is. I envy many writers their talent, but there are few authors whose books I wish I had written myself. 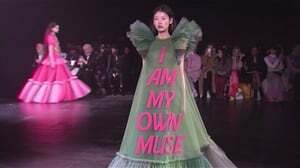 This novel? It falls in both categories. I believe that the power and tremendous accomplishment of this book lies in the fact that Laini Taylor's writing is so beautiful, so vivid and so full of phantasmagorical imagery, that it could make any person whose feet are firmly grounded in reality, believe in the world of Elsewhere that she's created. Her prose is incredibly sensual and very dreamlike and the world she builds within the book, is nothing short of spellbinding. Filled with plenty of mystery, dark magic and secrets, the settings jump seamlessly from country to country, and one realm to another - making you wish you could travel to every single place she describes. Add to that dynamic and interesting characters (Karou's really one of a kind), blisteringly hot romance (Akiva the angel warrior is both fierce and awesome) and an intriguing plot line and you have one of the most absorbing and gorgeously written books ever. I can't wait for Days of Blood and Starlight, the next book in the trilogy. Oh, and if you're still not convinced how fantastic this book is? Make sure you check out the book trailer below. Sign up for women24's book club newsletter and stand a chance to win our top ten books from kalahari.com. Women24 book club newsletter - sign up!